This holiday, pamper yourself with a well-deserved treat by making the luxurious Villa Nirvana your vacation home in the tropics. Nestled in an emerald garden, the grand abode is spread over three levels. 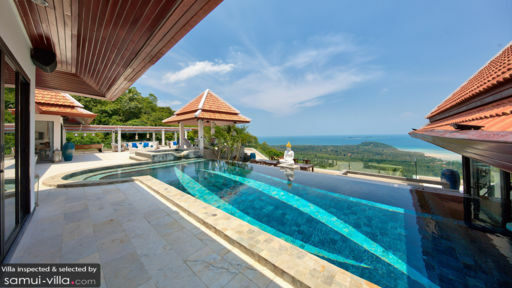 Perched upon an elevated spot, it overlooks the breathtaking coastlines of Taling Ngam and the Ang Thong Marine National Park. Seven homely bedrooms makes Villa Nirvana an ideal accommodation for large groups. Similar to the shared living spaces in the villa, the design of the bedrooms feature a perfect blend of modern and traditional elements. Modern fixtures, such as the polished wood panel flooring and teak furniture go well with unique paintings and beautiful lightings adorning the rooms. Thoughtful touches, such as the expansive floor-to-ceiling sliding doors, make the best out of the villa’s picturesque setting, for it provides unobstructed panoramas of the coast. The well-landscaped grounds of the villa does not fail to impress. Here, you will find a sparkling pool, large jacuzzi crafted from natural stone, and a spacious pool deck lined with gorgeous outdoor furniture. If you desire a break from the tropical heat, retreat to the shady interiors of the gazebo or refresh yourself with an icy cocktail at the outdoor bar. 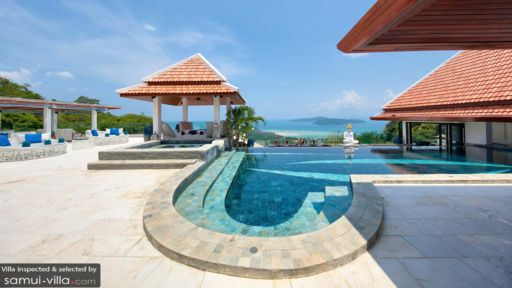 The idyllic setting, along with striking views of Samui’s coastal landscape makes the outdoor areas of the villa an irresistible hangout spot. Step indoors, and you will find living spaces swathed in seductive red. The oriental ornaments, abstract art works and wood furnishings add an Asian accent to the interiors. An open plan kitchen sits next to a dining area perfect for eight. If alfresco dining is your preferred setting for enjoying your meals, the breezy terrace extending out from the dining area will float your boat. A team of six professional staff offers impeccable service, ensuring that you will not have to lift a single finger during your stay. Sink into a state of utter relaxation by engaging the expert staff from SPA Lamai for a decadent in-house spa treatment. A well-equipped gym provides all the necessary fitness gears for travellers to catch up with their daily fitness regime. 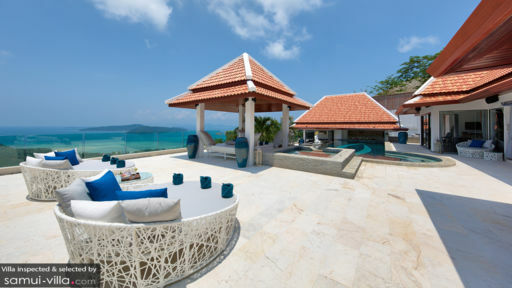 Villa Nirvana puts vacation makers within close proximity to a variety of attractions and activities. The choices are endless here, so fill up your days with exciting excursions to the Ang Thong Marine National Park, zoo, snake farm, aquarium, mystical Buddhist temples and cascading waterfalls. Visits to the local markets, shopping streets, beachfront restaurants and bars will please travellers in search of night time entertainment.